Our pens are some of the most exquisite in the world and therefore it is not surprising that a lot of our customers actually have fairly large collections of handcrafted Lanier pens. If you are one of them our pen displays cases are just the right product for you. Most of our customers have a wide range of ballpoint, roller ball and Fountain Pens in their collection. They value and cherish each and every one of them. However, more than that they are very proud of them and therefore almost all of them will have their pens on display. Our display cases are some of the finest that you will find. They not only have display your collection the way that it should be, they also keep your pens safe and very secure. You might wonder what makes our pen displays so special. To begin with each of our cases is made from solid wood. This makes the entire display solid and sturdy so you don’t have to worry about it falling down accidentally etc. Our pen cases are extremely functional. The insides of each case are lined and there are individual compartments for each pen. This protects your pen from getting scratched and damaged and also from rubbing against other pens. If you are a moderate collector this case is ideal for you. 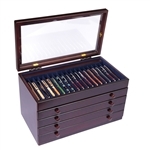 For our serious collector of the wood pen we have specially designed storage chests that are made out of Rosewood or Mahogany. These storage chests have drawers that can accommodate up to 12 pens. Each draw has insides that are similar to our displays. They also have fine brass knobs. A storage chest can hold up to 86 pens in total.